....fish. my buddy Davor from Croatia caught these on a topwater.I'm not much of a photographer(I should have got a close up of the fish)but to me they resemble bass can you guys tell? We don't eat ANYTHING that comes out of Z Lake but some of our laborers snatched them right up! kind of looks like a tarpon/bass cross? I bet you can find it here, but PUI tonight so you are on your own. However, please post the "winner"
Looks to me like a variant of a Snook with some trout thrown in.. I don't know, they kind'a look like Pickerels to me. 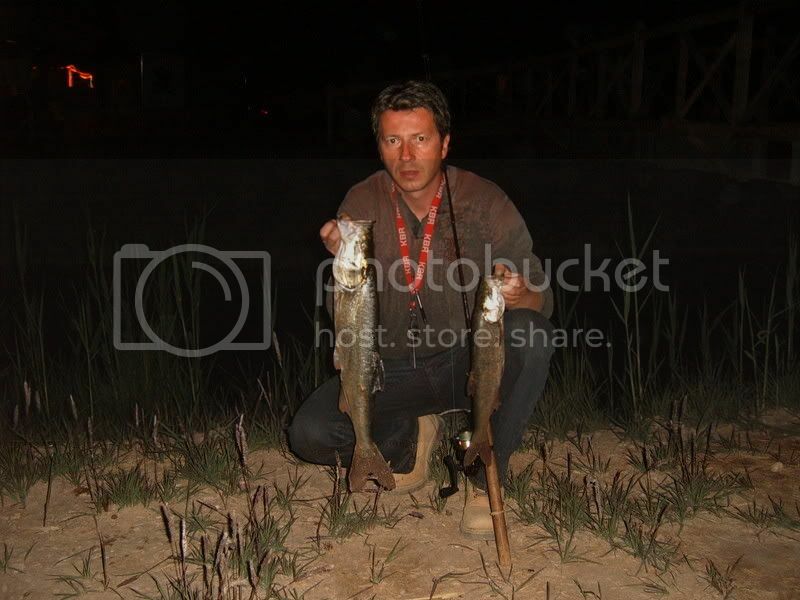 edit: Top water bait, at night, probably close to shore or structure or a weed line.....I figure they are Pickerel. The picture doesn't really show them that good, I bet they've got really big eyes. Just so you know, Pickerel are mighty fine tasting fish! That's what i was thinking. Looks kind of like a skinny snook. Post the picture on the Sportfishing forum. There are some resident fish experts on there who can probably give you a positive ID. Here is a link to a story done by Brian Williams on NBC nightly news in which they mention a lake that Saddam had stocked with a specially bred bass they called "Saddam bass." could they be Zanders? they are a european fish in the walleye /perch family.